And today, I’m heading to Dallas to meet up with my favorite roomie again for the Bloom Workshop! I’m so excited to be part of this gorgeous event. I just hope I can articulately answer the questions asked during our Q&A panel! Today I’m wrapping up this Fall Basics series (see Outfit #1, Outfit #2, and Outfit #3 if you missed them) with one of my most reached for Fall fashion combos. 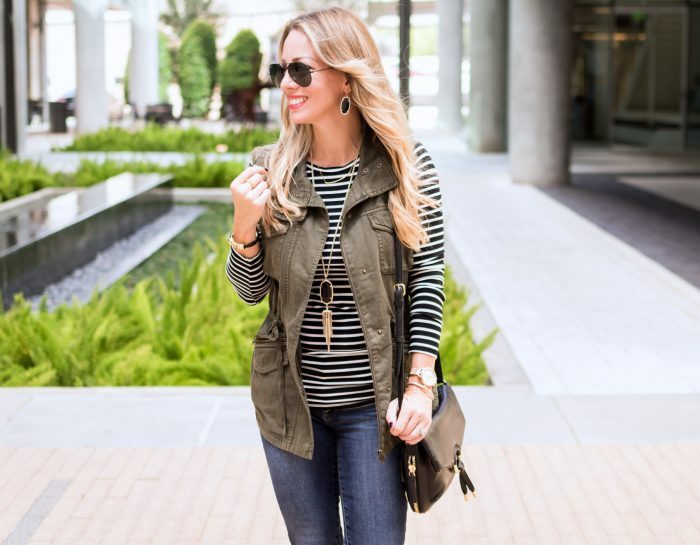 It doesn’t get much easier than a simple long sleeve tee (and I’ve got two to show you, a striped must-have and one with a fun peplum hem!) 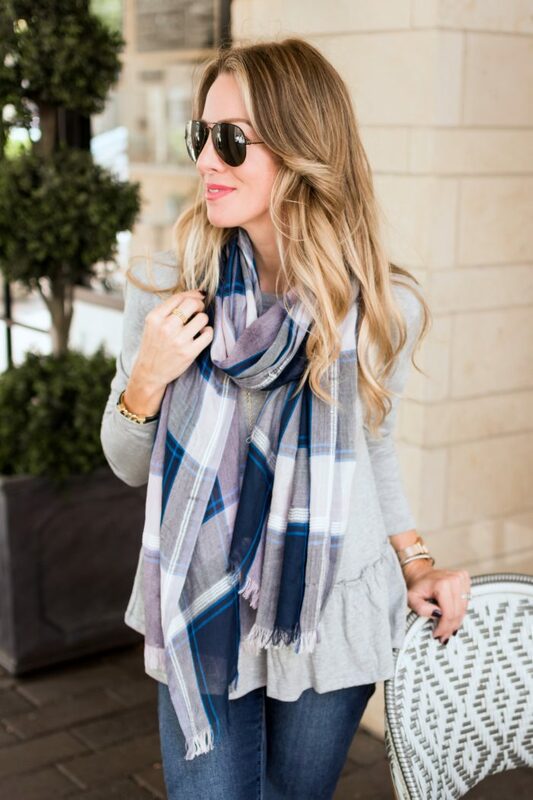 and either a military vest or lightweight scarf (plaid or leopard) are my faves! 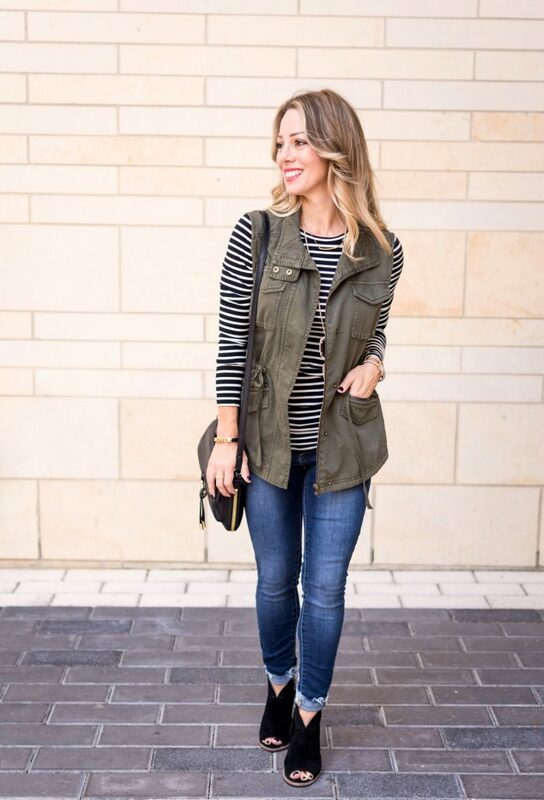 A good military vest goes a looong way here with our warmer Fall and mild winter. You’ve heard me rave about this one because it’s such great quality and it comes in XXS, which is what I’m wearing here. I love that it cinches at the waist to help create a more hourglass shape. 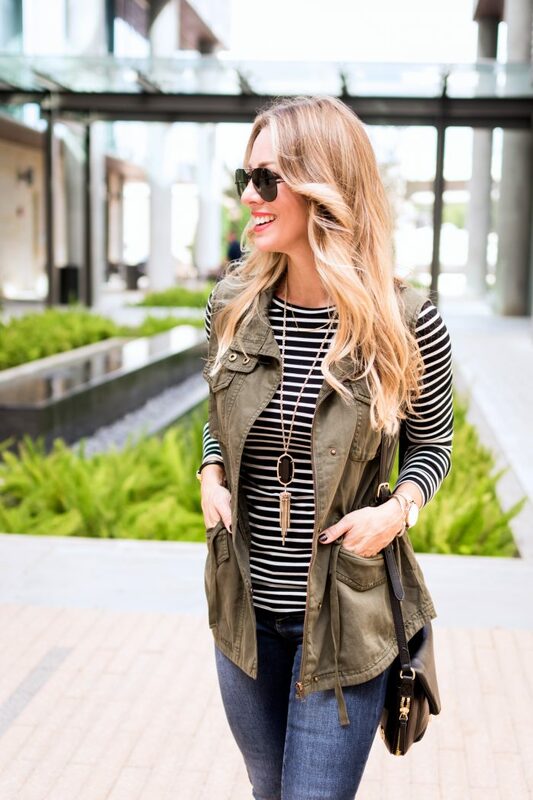 Some military vests (and jackets for that matter) can tend to be really bulky, but this one isn’t. I like all the details on it too from the double pockets, buttons and zippers and double stitching. Those ‘extras’ set this one apart and make it look expensive, but it’s very reasonably priced! 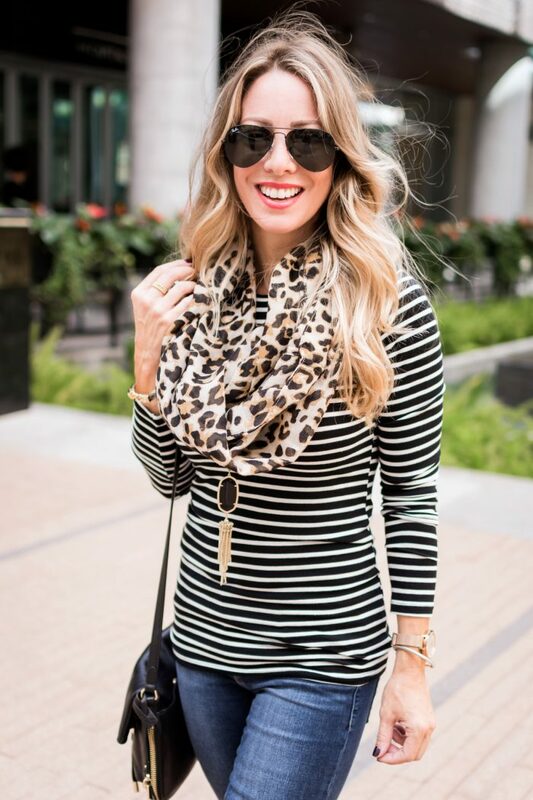 I also love the look of stripes + leopard, don’t you? 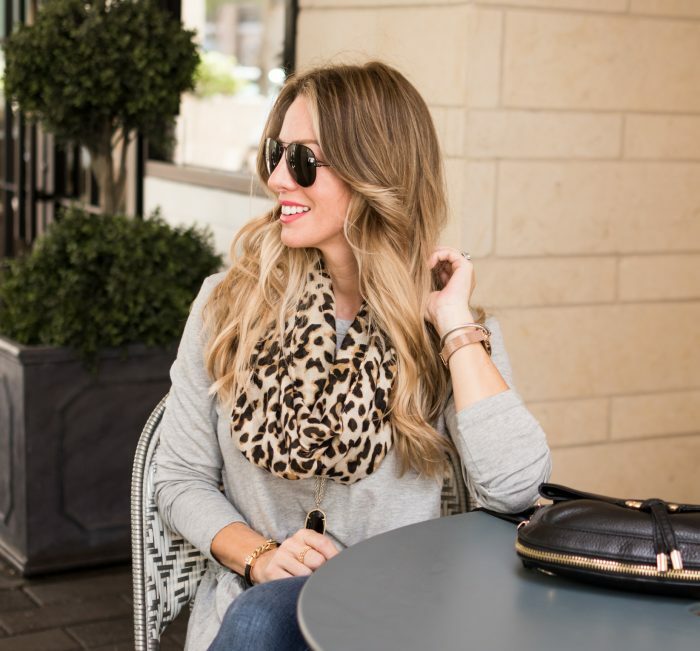 You’ll get a great pop of leopard in this scarf. 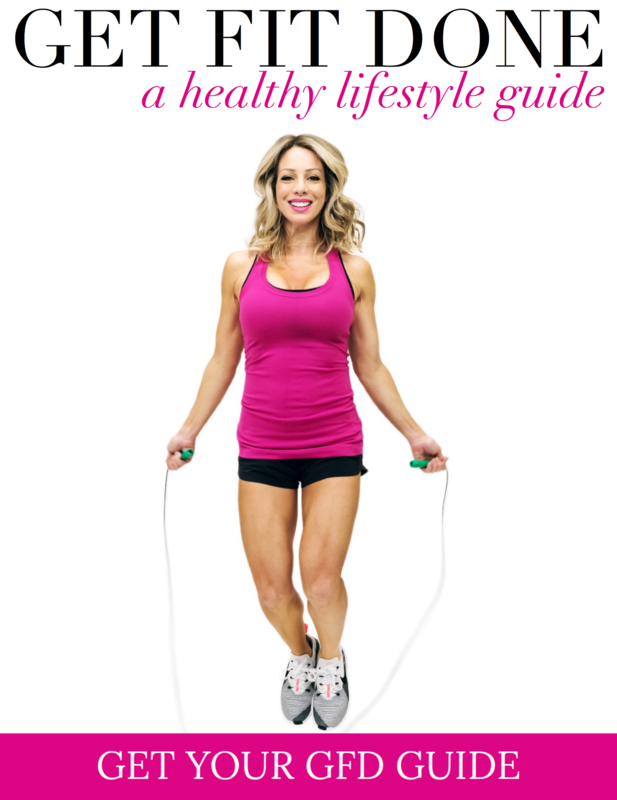 Mine is old, but this one is out now and under $20! 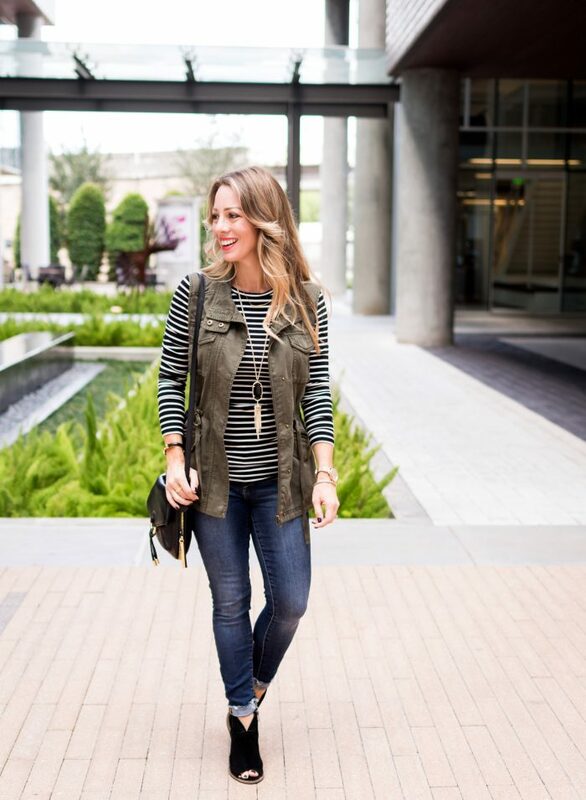 The striped top does come in solids too and it feels really good and smooth on your skin. It’s on the thinner side, and also runs a little long, so I tend to bunch mine a little around the hips. And I usually also wear the sleeves pushed up to 3/4 length because I like that casual look. It comes in petite and that works for me, but since this top is clingy, I got a regular XS in this one. The next ‘basic’ long sleeve top you’ll love this fall is this peplum-hem style. The little ruffled peplum bottom gives it a special detail that is pretty adorable. I find this brand runs big, but luckily they come in petite. It comes in 6 colors and also stripes! So, of course I had to show you how cute this number looks with the military vest too. Same outfit, just switching up the booties and different top. I’m so bummed that my order of these booties in taupe was just cancelled! I keep checking but they don’t have my size! 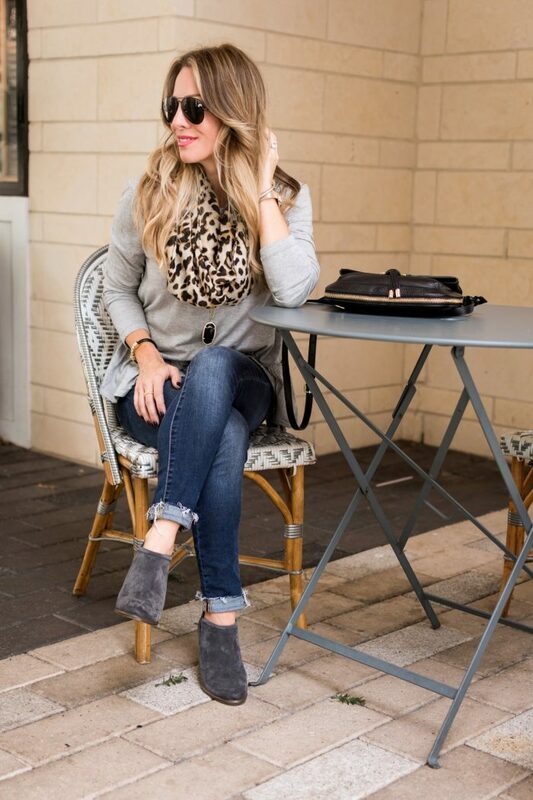 These are the booties I keep reaching for and love the comfort, fit and style so much! I hope they restock my size! And if you want a little bit of color or pattern, just add a scarf. But you knew that! The leopard and this plaid purple/pink/navy are my current faves. And just to give the leopard a little more love . . . 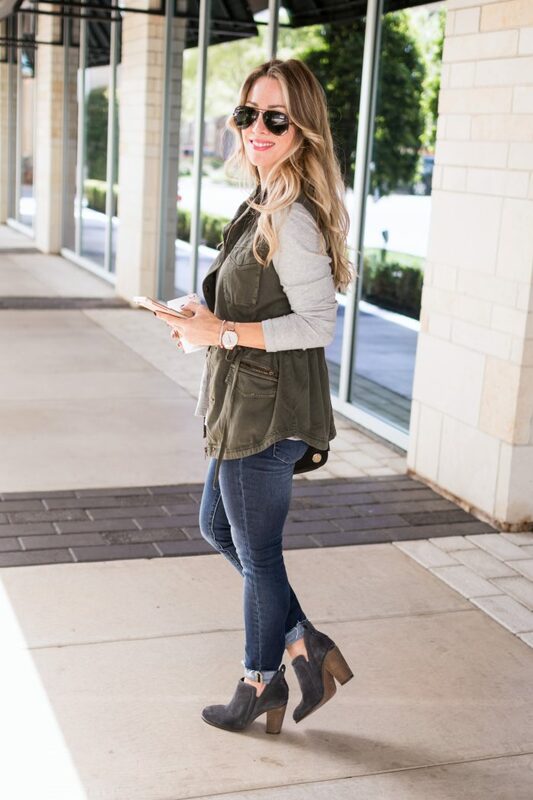 I hope you enjoyed these Fall Basics posts- even though they are simple outfits that are easy to pull together, I hoped you like seeing things on and which basics are tried and true in my book! I’ve never paired leopard and stripes but you’ve totally sold me! Heading off to order that plaid scarf!! Yes! It’s one of my favorite combos! Great post! Off to get those gray suede booties! They are my favorite right now! I hope I can get the taupe too! Very cute and have all similar items in my closet! With all due respect, these fashion posts are getting kind of boring. 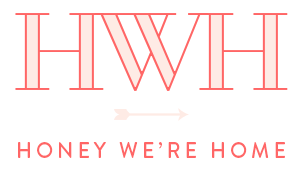 Miss the home improvements, organization posts, decor & fitness posts. Did not intend to offend, just my opinion. 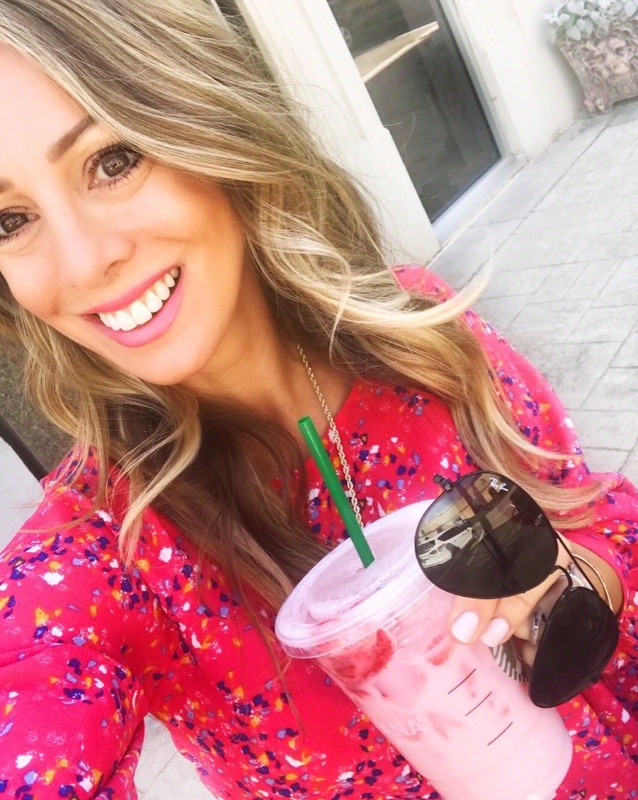 Thanks for your feedback Maria- I appreciate you letting me know what kind of content you like to see here! I love the fashion posts. I always get new ideas as to how to combine things I already have and judiciously choose new pieces to incorporate. I don’t find them boring at all. 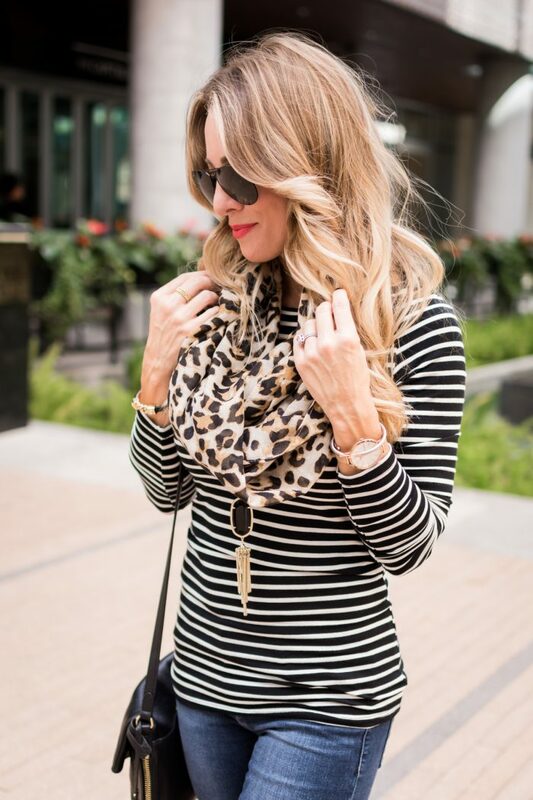 I love to mix stripes & leopard! 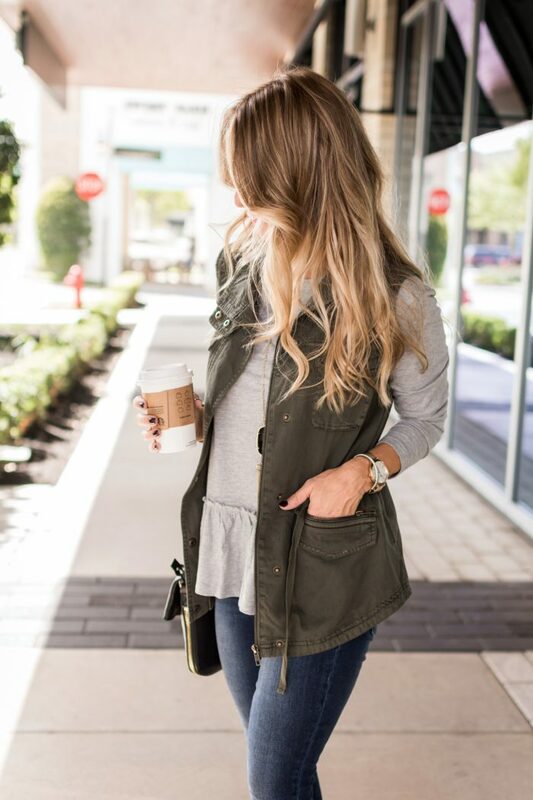 First outfit is similar to what I am wearing today minus the vest because I can’t find mine! We’re twins!! 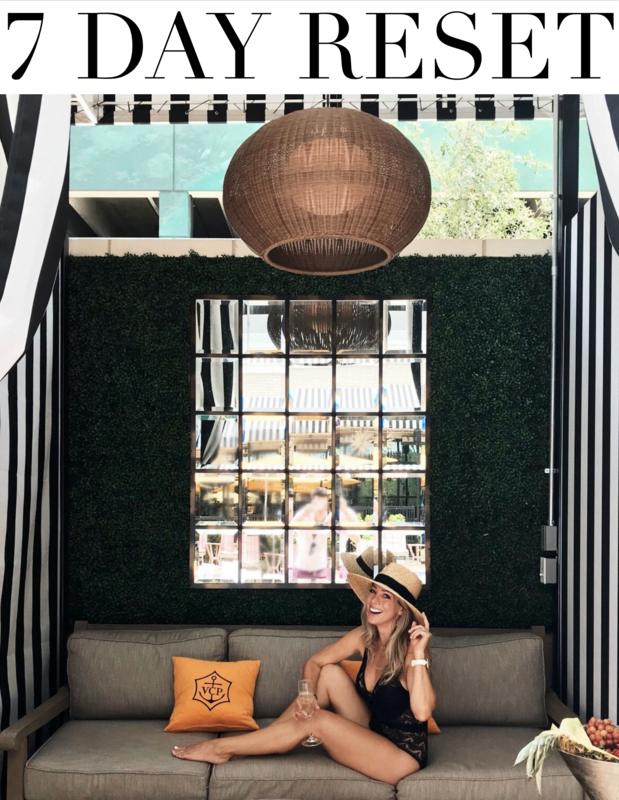 Thanks for letting me know you find inspiration here- I love to hear that! Happy Saturday!